I just finished doing a little write-up about what I hope to accomplish in 2012 for personal fitness, artist endeavors and creativity. I encourage you to go read it on my brand new blog. 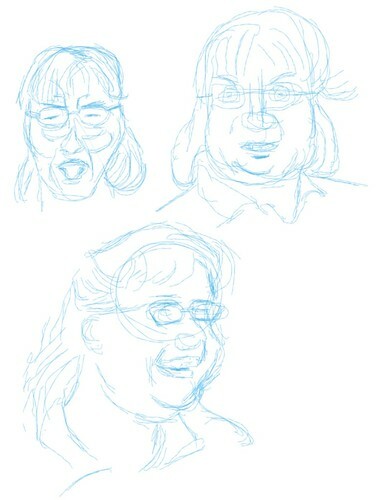 I tried a few portraits from a book called “Facial Expressions” by Mark Simon. As you can see, the top left one is my first, while the bottom one is my third sketch. It always take me some time to get accustomed to drawing faces, especially on a strange device like an iPad, using an app that’s a bit lagging on the original iPad. My sister breeds Bengal cats for a hobby (a serious hobby, involving serious money, but a hobby nonetheless). She doesn’t keep her cats indefinitely, but gives them good homes, so she can keep improving her “stock”. Anyway, she posted a photo the new owner took of one of those re-homed cats. I decided to use it for my process of silhouetting. 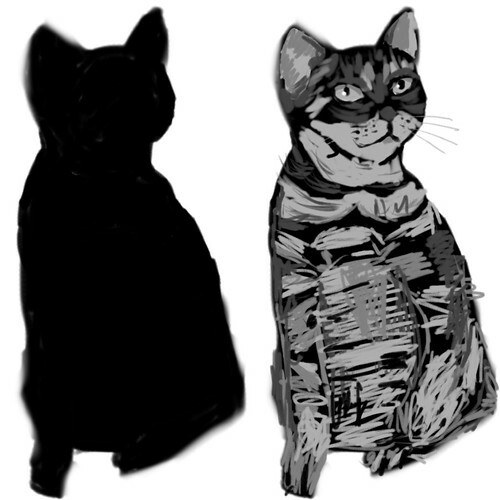 The silhouette on the left was drawn first, copied as a layer and then lighter colors were drawn on top of it. I concentrated on the face and made the rest rather sketchy (or is that sloppy?). It’s not a 100 % accurate reproduction of the original pose, nor even close to the rendering of the photo. So I think this still means I used the photo as a reference, a close reference, though. The podcast Grammar Girl had a good episode 292 about overcoming writer’s block, written by Roy Peter Clark, who teaches at the Poynter Institute. Especially "Lower your standards, raise them later," seems to apply to me. I get bogged down by how awesome my story is going to be. It paralysis the creative output, paraphrased from Mignon Fogarty narrating in the podcast. First of all let me apologize for not posting for so long. I was preoccupied with personal fitness, which had gone down to an all-time low. Getting back into shape (which I’m still busy with) took all my attention, but now I’ve dialed down the intensity a bit, I have energy (and time) to resume writing. Now about lowering your standards at the beginning. This very post you’re reading started with a few sentences written with a ballpoint pen on a piece of paper. Then I didn’t use a fancy text editor, but just what came with the OS (TextEdit on Mac OS X). To help me with the formatting a bit, I used Marked by Brett Terpstra. It accepts markdown, as suggested by John Gruber of Daring Fireball. It also accepts an "improved" version of markdown, called multimarkdown, as developed and maintained by Fletcher Penney. Both methods use plain text files without special formatting (like RTF). The text and the formatting of the text are both readable, in characters you type on a keyboard, not by selecting text and applying style to it, as you would do in a word processor. Special tools exist to translate these plain text files into publishable formats, like HTML. You only need to write one source file to have multiple publication formats. But never mind that, though. Use whatever tools work best for you. The point I wanted to make is that I used the simplest of tools, as lo-fi as possible, to lower my expectations and simply write instead of worrying about how it looks. As useful simple and unpretentious tools may be for the writer, he or she still has to walk the walk. The basics of writing haven’t really changed in the last few hundred years. You need to come up with an idea that makes you want to work hard at something that (hopefully) will grab the reader’s attention. Now as a writer you can only entice a reader to keep on reading. So how about that? How do you even begin to work on that part of the writing process? How do you get people to read what you write, especially if those people don’t know you personally? Well, as an experiment, I went over some of my fondest childhood memories related to reading books. My reasoning was that if I can capture this feeling of fondness, use it for writing, surely some of it will be picked up by the reader. Maybe he or she will think: "Wow, this is good stuff! I need to read more of this!" If that’s the case: yay! As a kid, I really enjoyed reading C.S. Lewis’ Narnia, "The Lion, The Witch and The Wardrobe" (in Dutch translation), which my mother lent from the local library when I had the flu and high fever (41 C, 106 F). I could only read a few pages at a time before I feel asleep from exhaustion, tears to my eyes. I’m not sure if those tears were from exhaustion (fever) or excitement (story). I guess a bit of both. It made the pain in my bones feel somewhat bearable and gave me something positive to think about when I was awake. Sometimes your imagination can be sparked by something else than a book. I have fond memories of watching tropical fish in a fish tank. The sight made me imagine another world from my own, completely alien, but real. Real to me at least, at that moment. I can’t remember the specifics, though, because I didn’t write them down. I think it is this mindset of a young child wondering about the world you should be after, not indulging into some kind of nostalgia. There’s nothing wrong with the latter, other than it isn’t very productive for writing. You want the feeling, the mindset, not the accompanying train of thoughts of how things were better when you were young. You want a sense of wondering, of seeing something for the first time, and wanting to explore it with a sense of discovery. In this mindset you could write the stars in the Heavens, if you wanted, and convey your deepest, most inner feelings to your readers (as you should). Most likely, though, your very first draft will not accomplish the latter. You need to craft your story first before you can do that. However, if you don’t capture the description of your initial feelings, when things are still fresh in your mind and haven’t been tested and prodded by the story-writing process, you can never blossom as a storyteller. You need to be always on the ready. There’s no such thing as a part-time creative. It’s a full-time commitment, because new ideas can come to you at any moment and you need to capture them, then and there. With the above in mind, I think one should use this child-like mindset for a first draft only, to get the rough emotions on paper, in words (and in the case of comics, in words and pictures). It’s the longing for something awesome, for something new and exciting, that you want to put in the reader’s mind. I didn’t do that with my childhood fish tank experience, but, as an adult and aspiring writer now, I should apply discipline to my craft if I want to be more than just another hack who only does first drafts. You may now think I’m harping on it too much, like a religious zealot and you may be right. I can get carried away a bit by new insights. I’m sure I’m preaching to the choir here for you more experienced writers. Experienced as a writer, a fiction writer, I am not. So this hopefully explains why I’m stating the obvious, to some of you at least. I suppose in the second, third, etc. draft you start to use your skill as a writer, reorganizing events. You want to take the reader by the hand and gently lead them through your world, using a plot, a sequence of events, to tell them what this world is about. You, the writer, are not in that picture, not for them and not even for yourself. It should be all about the experience, the experience you had and want to share to others. After all, isn’t that what fictional storytelling is all about, sharing sublime experiences? Runners like to make fun while running. However, it’s a basic kind of fun without little refinement. 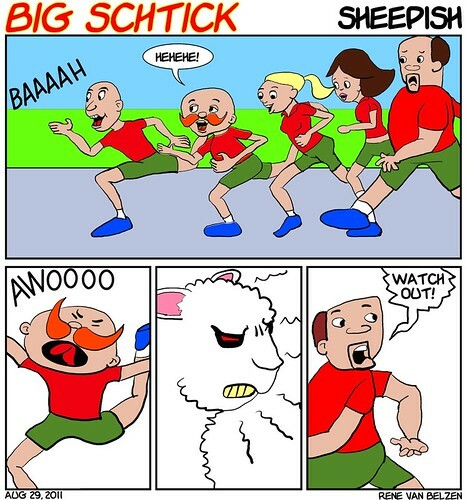 Especially long distance running can be a bit boring at times and a joke to lighten the mood makes the boredom go away.